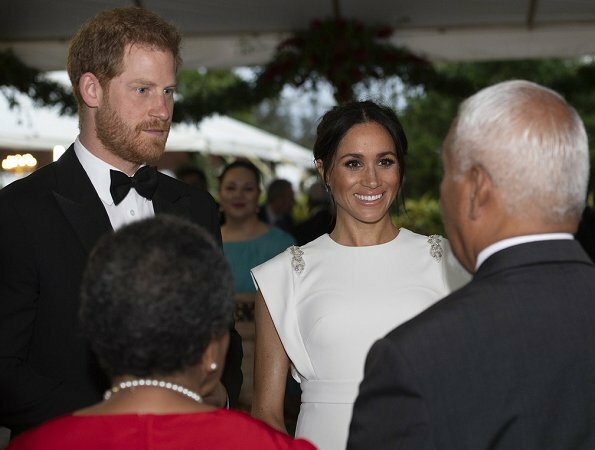 In the evening of October 25, 2018, The Duke and Duchess of Sussex visited Consular House in central Nuku'alofa for a private audience with King Tupou VI and Queen Nanasipauʻu. 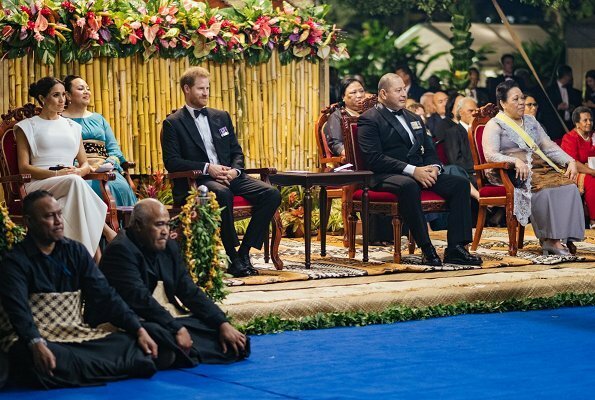 Afterwards, an official reception and state dinner were held with traditional Tongan entertainment. 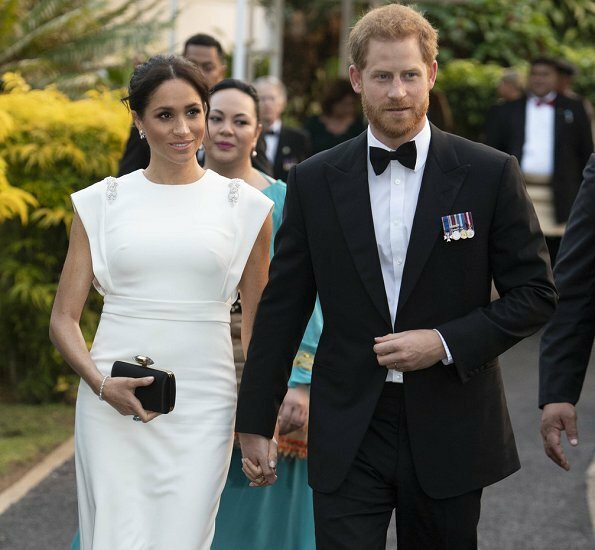 The Duke and Duchess are on their official 16-day Autumn tour visiting cities in Australia, Fiji, Tonga and New Zealand. (The Duchess wore a ivory embellished cap sleeve silk satin gown by Theia Couture). 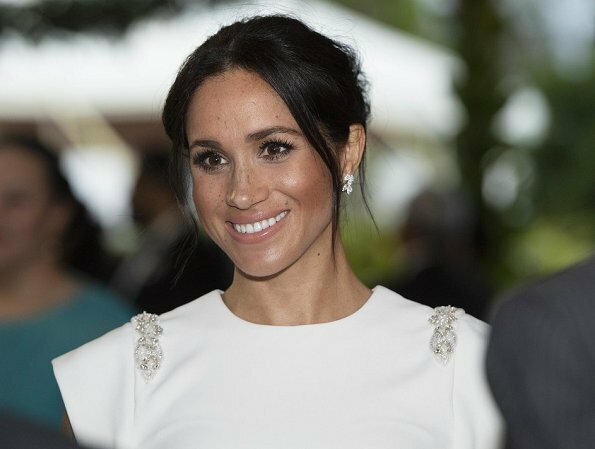 I like this, some vibes of 1940-50 fashion and white is such a beautiful colour on Meghan. 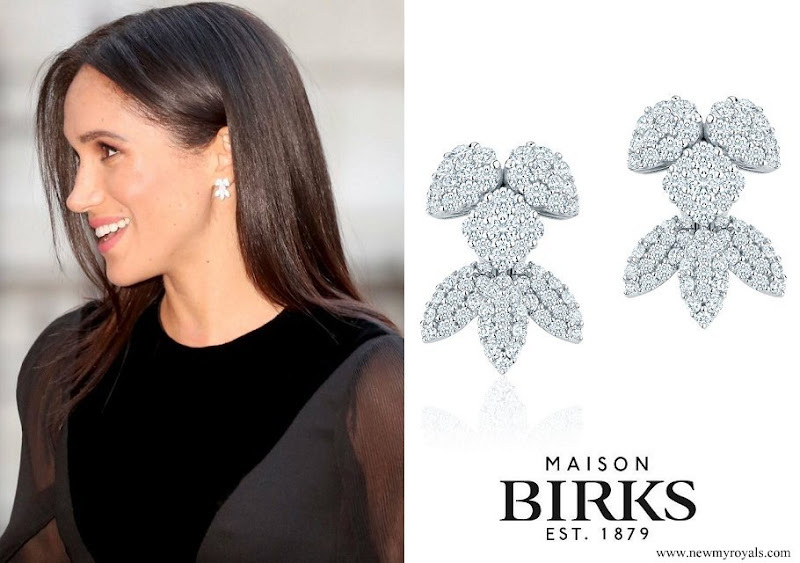 Perfect earrings to the dress! 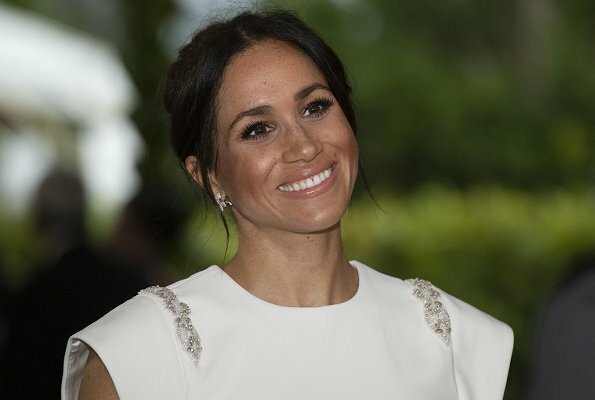 Meghan looks beautiful. Lovely gown, very flattering. Great jewellery. Stunning! Something about the shoulders of this dress is just not good for me, then I realized it reminded me of some Star Wars (or any similar star movie) uniform. 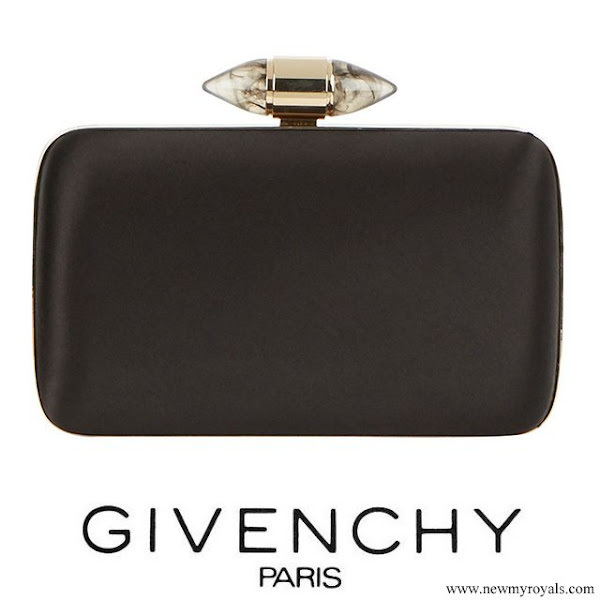 I do like the contrast of black shoes and purse with the white, very classy. The dress is fine , Megan has a wide shoulders. I have the same reaction. The dress exaggerates the line of the shoulders, which is unflattering. Me encanta este vestido. Es exquisito, el mejor de todo el viaje. Pero su vientre ha crecido rápidamente y ya todos le están estrechos. No puede llevar ahora cómodamente la ropa ajustada que salió de Londres en las maletas. Se impone ropa pre-mamá. This is a fantastic look. Simple white and elegant. Keep it up. Just wonderful. Love that bright white on her. 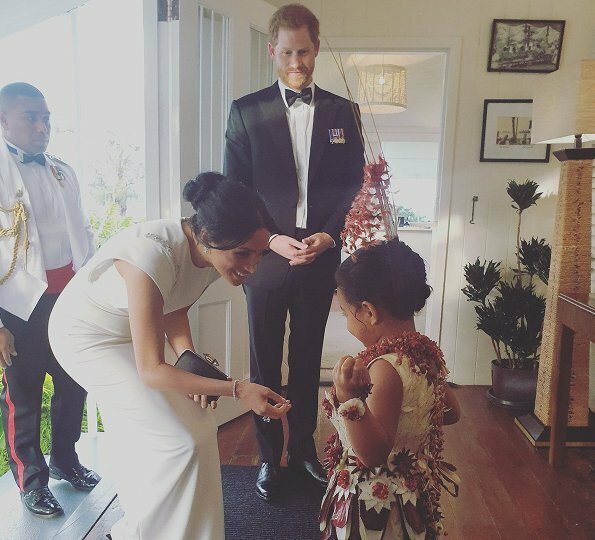 the white dress is nice for the occasion of a private audience, but if she also wore it on the state dinner afterwards than it's to casual for that. I dare say, the exaggerated shoulders draws attention away from her waist line which is thickening due to pregancy. The result being the perception of a slim waistline. I agree. The dress has a 30's feel. At first glance I thought she was wearing dress clips. I do hopw we will see this dress again after the pregnancy. 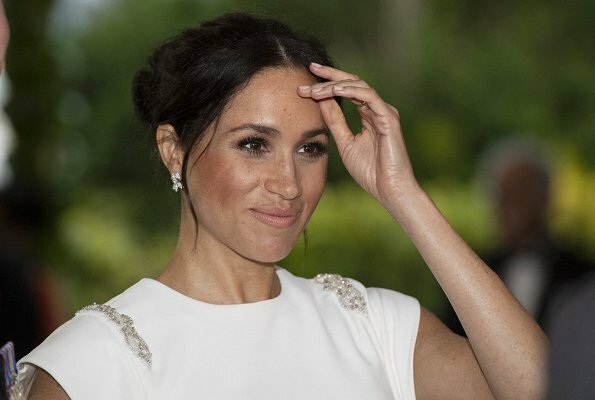 Meghan really does know what colors she looks best in. She is stunning!